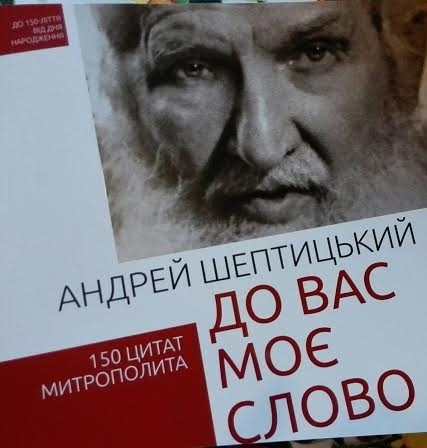 The book of quotes by Andrey Sheptytskyi "To you my word" was published and those statements are relevant today. The publication is timed to the 150th anniversary of Metropolitan Andrey. The book presents 150 quotations from His works, letters, emails and speeches relating to various aspects of society. The statement by Bishop Andrey are divided by themes - for spiritual sphere, culture, education, patriotic education of youth, economic initiatives, policies, etc. - and are accompanied by illustrative material and explanatory texts. Pictures are called to convey the spirit of the epoch in which Metropolitan Andrey lived and represent scenes of the present time, that somehow resonate with His thoughts and directives. The project manager Bishop Bogdan (Dziurakh), the Secretary of the Synod of Bishops, noted that "in this book the Metropolitan appears to us not only in His wisdom in the context of His own epoch, but in His prophetic dimension, in His prophetic spirit, because His word is relevant for today's reader, for present Ukraine". Bishop Bohdan thanked "the creators of books that could combine wisely historical and contemporary illustrating material", which, He said, actually "shows this continuity and relevance of the thoughts and teachings of Metropolitan Andrey". The chief editor Volodymyr Il’chenko said that the most difficult work on the book was to pick up the Metropolitan quotes, because they had to read His letters, speeches - all that was available of published. This, of course, requires a lot of time. "However, I think that immersion in a spiritual and artistic heritage of Sheptytskyi was useful for the editorship. We decided to split statements on the topics – for readers it is easier to navigate around the text array. Especially it was interesting to work on a section of social vices, the eradication of which Bishop Andrey paid much attention. He was and is very close to people and their problems, expectations, and we tried to convey this in a book, "- said Mr. Volodymyr Il’chenko. "I think anyone who takes in hands this work, will be inspired with a spirit of the Metropolitan. The best memory and gratitude for this great man and pastor of the Church will be when we learn at least a speck of His knowledge and realize it in life", - said Bishop Bogdan. The book is intended for anyone interested in the activities of Andrey Sheptytskyi, national history and looking for answers to many questions of socio-political, spiritual, moral and ethical plan. It is published with the support of the charity fund "Renovabis".